Glyciphage (Metformin) is a type of drug known as a biguanide, which is given to patients as a treatment for diabetes mellitus type 2. Glyciphage (Metformin) is a type of drug known as a biguanide, which is given to patients as a treatment for diabetes mellitus type 2. This drug works in 2 ways. Firstly, it reduces the absorption of glucose from food, while at the same time decreasing the liver's production of glucose. Secondly, it stimulates the body's natural response to insulin. This helps to control the levels of glucose in the blood. In some cases, this medicine may be used to help prevent at risk patients from getting diabetes. Treatment with this drug may cause weight loss in some patients. When using Glyciphage (Metformin) tablets to treat and control diabetes, the instructions of the prescribing doctor must be followed. Usually, adult patients are directed to take it 1 to 3 times per day together with meals. It is important to consume an adequate amount of fluids while taking this drug, unless your doctor tells you not to. During the course of treatment, your doctor may conduct blood sugar levels, and will use the results of these tests to determine or adjust your dosage. Never exceed the dosage prescribed to you. Inform your doctor about any side effects you notice while undergoing treatment with this medication. Serious reactions requiring immediate medical attention include chills, fever and a rapid increase in weight. Other severe reactions which have not been mentioned here may also occur. Consult your doctor if you suffer from any reactions not listed. In extremely rare cases, this drug may cause a very serious condition known as lactic acidosis. This condition requires immediate cessation of treatment and emergency medical care. Ask your doctor about the symptoms of this condition, and ensure that you and your family members are prepared in case it occurs. Low blood sugar may occur, and this is more likely if your doctor has prescribed this medication for use in combination with other antidiabetic drugs. 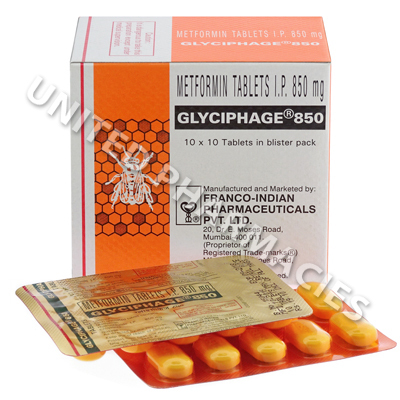 Always use Glyciphage (Metformin) as you have been prescribed by your doctor. Never self-medicate or change your dosage without first consulting your doctor. The correct dosage can vary depending on your health, medical history, and the severity of the condition being treated.